WE'RE CELEBRATING! YOU COULD WIN $10,000! Finch Hyundai is very excited to be celebrating our 10th Anniversary as a Hyundai dealership! Over the past 10 years we've helped over 15,000 people buy a new or used vehicle as one of the top five volume Hyundai dealers in Canada! 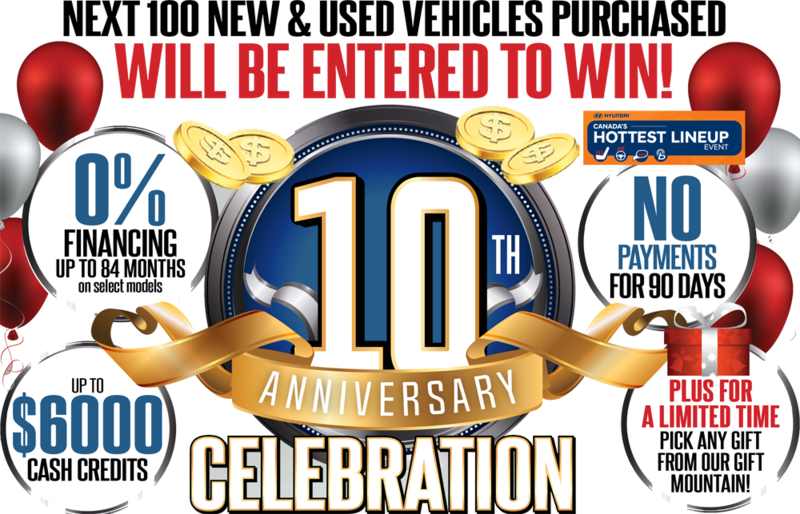 In honour of this massive milestone, we are going to help one lucky customer win $10,000! If you are 1 of the next 100 people to buy a new or used vehicle from Finch Hyundai you'll be entered into a draw with a 1 IN 100 CHANCE AT OUR $10,000 GRAND PRIZE! With rates as low as 0% FOR UP TO 84 MONTHS and CASH CREDITS AS HIGH AS $6,000, December is the right time to buy. Only at Finch Hyundai! STOP BY TODAY FOR YOUR CHANCE TO WIN $10,000! THIS OFFER IS AVAILABLE ONLY AT FINCH HYUNDAI AND ONLY FOR A LIMITED TIME!